A routine is a template, a list of exercises that you plan to do during your workout. Your actual workout may be different – you may skip or replace or add some exercises. 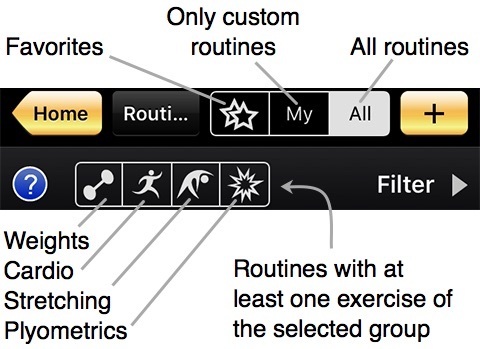 Routines make using GymGoal during the actual workout more convenient. Even if you add all your regular exercises to favorites, without a routine you will tap the screen about 3 times more than you would with a routine. A routine can have several days. For example the whole routine works whole body, but the total list of exercises is split into 2 days: Upper Body and Lower Body. The first selector allows to see only routines with the specific number of split days. The second option specifies the technical difficulty of the routines. The third option – equipment type. Tap the routine name in a list to open details. This screen show routine exercises. adds this routine to the schedule. Select Start > to start logging your workout with this routine. You can Email this routine in a readable file, for example for printing. If you want to share this routine with another GymGoal user, you can email it in a special file. If that person opens your email on his iPhone and taps the attachment, this routine will be added to his custom routines in GymGoal. Show muscle names shows muscle names above the exercise names. Body Map shows a body map that highlights muscles targeted by this routine. History shows the list of logged workouts that were based on this routine.